The other day I visited the thrift store in the town where I work and I got quite the surprise… a Christmas section already set up… and before Thanksgiving! This is a little unusual to say the least. Honestly I haven’t even given Christmas a second thought yet, let alone a first thought. Thanksgiving is this weekend, and we don’t usually see Christmas stuff in the stores before that… and I don’t usually think about Christmas until after that. Now I do have to say that it was just a small section, they’ll be expanding it later on, but still… I was a little take aback at first. But then I thought… why not? I know some people like to get going with their Christmas projects and planning ahead of time so it’s probably helpful to find some things early. And I’m sure the thrift store has so much Christmas stuff that it’s a good idea for them to start early too. So with those things in mind I decided to take a look… and I’m happy to say that sometimes the early girl catches the bird. lol. As I’ve mentioned many times before the fun part about thrifting is finding things you’ve never seen before. 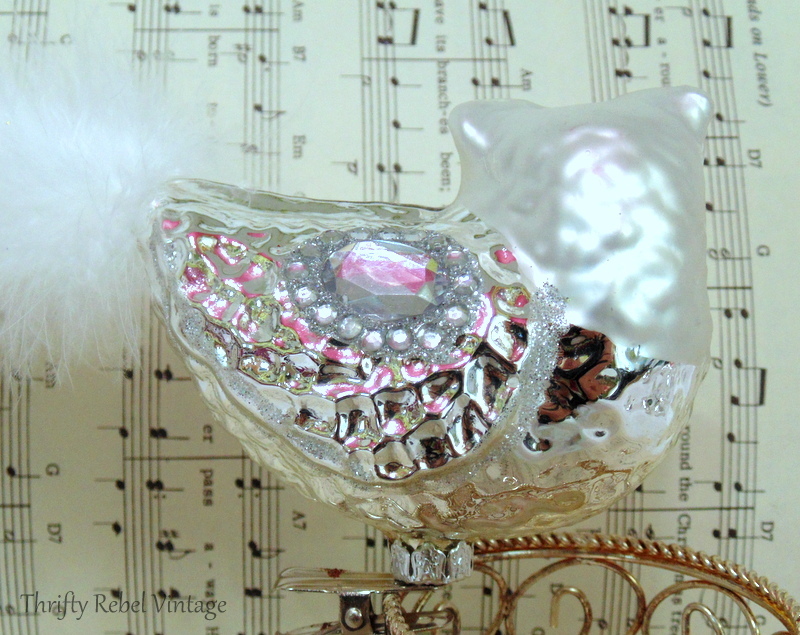 Like this mercury glass Christmas clip-on owl ornament. Isn’t he sweet? He has a lovely white feather tail and beautiful details. Check out his sapphire blue rhinestone eyes. Don’t they seem to be looking right at you? Just like the real owl that John and I saw in the forest at my mom’s cottage last fall. We went for a walk down the old lumber mill road and saw the owl sitting on a large limb of a dead tree. It was definitely looking right as us… and watched us very intently for a few minutes. There’s something quite noble about the confidence of owls. They don’t seem to be afraid of anything. Once it decided we weren’t going to cause any trouble it flew to another part of the forest and we went on our way. 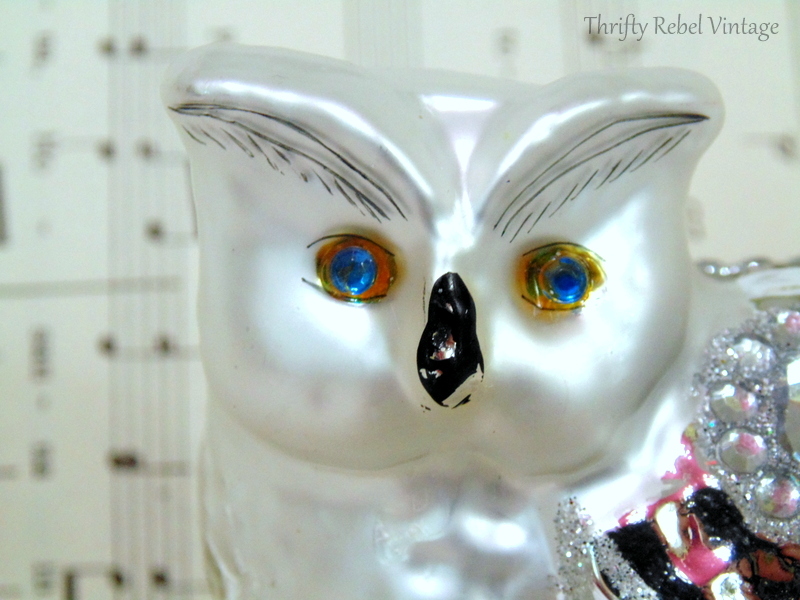 I have to say that my mercury glass owl looks pretty friendly. I’m calling him a him is because he has blue eyes. A girl owl would definitely have pink rhinestone eyes. lol. The wing has a lot of lovely details too, like the silver glitter. When I first saw the wing I was sure there were clear rhinestones in those little circles, but there isn’t. Somehow the glitter around the indented circles creates the illusion of rhinestones. It’s pretty ingenious! No rhinestones to fall out. The pink refection you see in the mercury glass is my hot pink craft room ceiling. I didn’t even notice that while I was editing my photos, but I’m ok with it. It really shows how reflective the silver glass is. And the attention to the details continues on the back. There are no markings on the cap or the clip, and after googling until I could google no more I came up empty. Even though I now know he’s not really old I still think he’s pretty amazing, and I’m so glad to have found him. 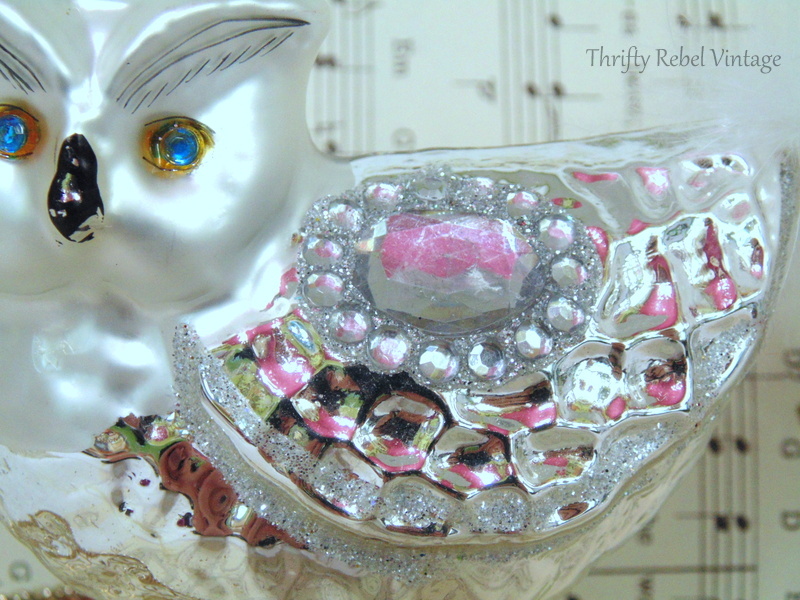 What’s better than finding one fabulous mercury glass owl ornament? 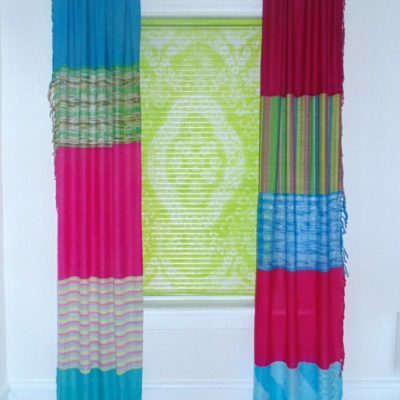 Finding a set of three! And for just one little loonie! That’s a one dollar coin here in Canada. I kid you not! 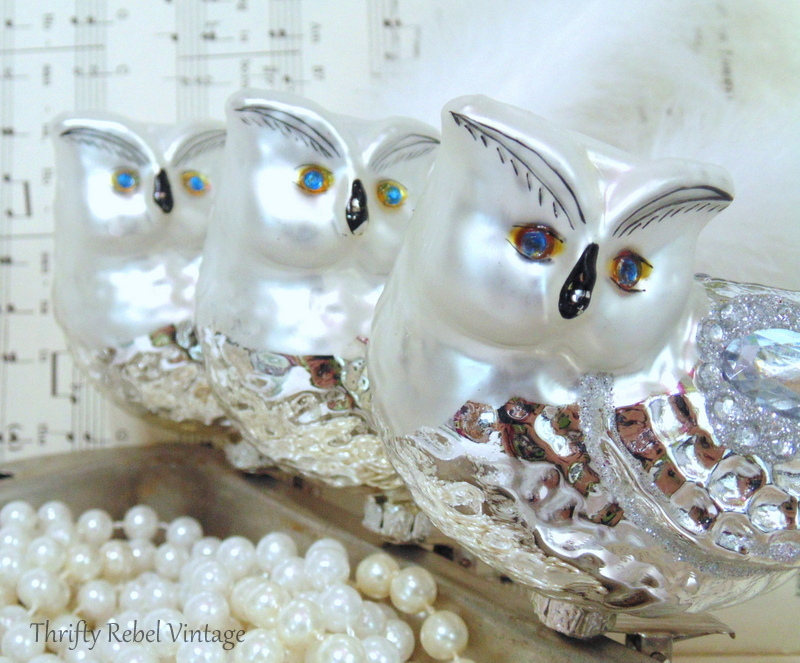 You can tell these mercury glass owls were hand-painted because the painted details are slightly different on each one. They are all in excellent condition, minus a little paint coming off their noses… which is to be expected I guess. I’d say it was pretty darn loonie to have these priced so cheap. Those fluffly white feather tails are like delicious icing on a fabulous Christmas cake. 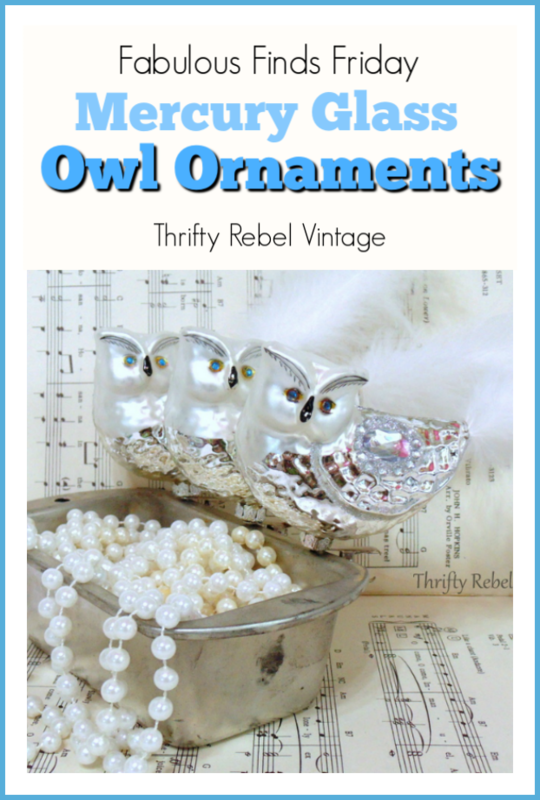 This early girl is thrilled to have found these 3 fabulous mercury glass owl ornaments. They have found a good home, and I can’t wait to display them this coming Christmas. But not on our Christmas trees. I don’t put glass ornaments on our trees because we have four feline friends who sometimes can’t resist sparkly dangling things. Who can blame them? So I have a cool idea for how to display these elegant guys and keep them safe from furry paws, and I’ll be sharing that when I actually start thinking about Christmas. So what do you think of my owl trio? What a good find. I found several on ebay USA. None as cute as yours or exactly like yours. 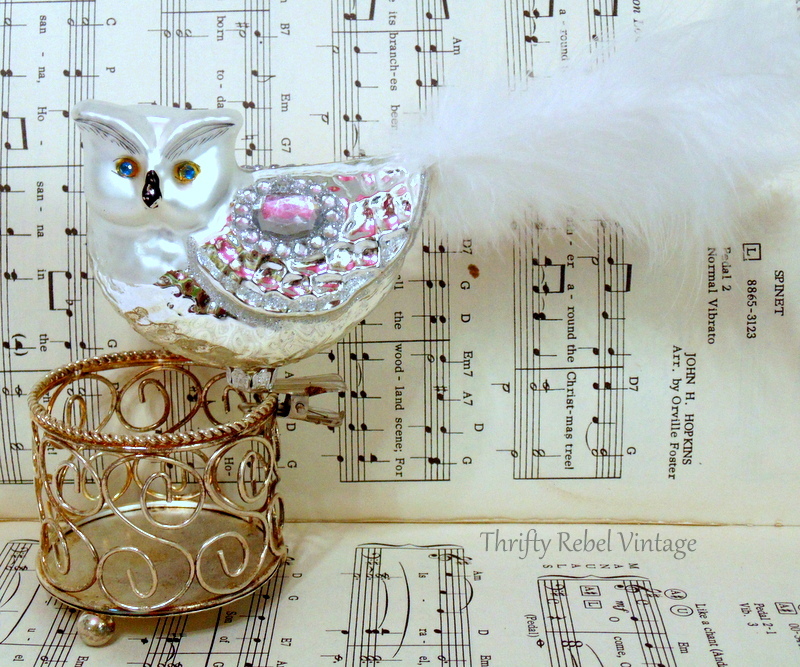 I put in “mercury owl clip on ornament” Completed listings had a pair and they sold for $19.99. You definitely got a good deal. I think the feather tails are what make yours so unique.
? OMG! 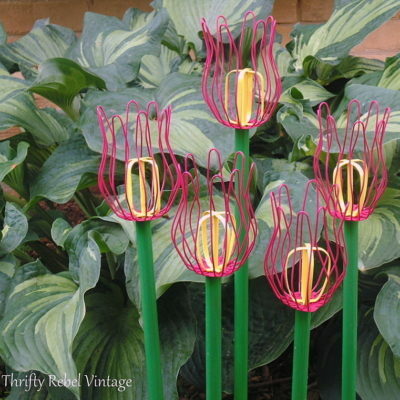 Those are fabulous!!! You did soooo well! Great find! I would’ve snatched those up and ran before they realized how low that price was. I have multiple vintage birds and new peacocks, but those are amazing! 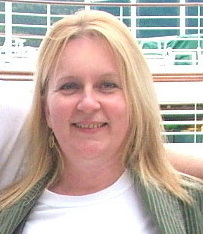 Thanks so much Terry! They were definitely a lucky find. 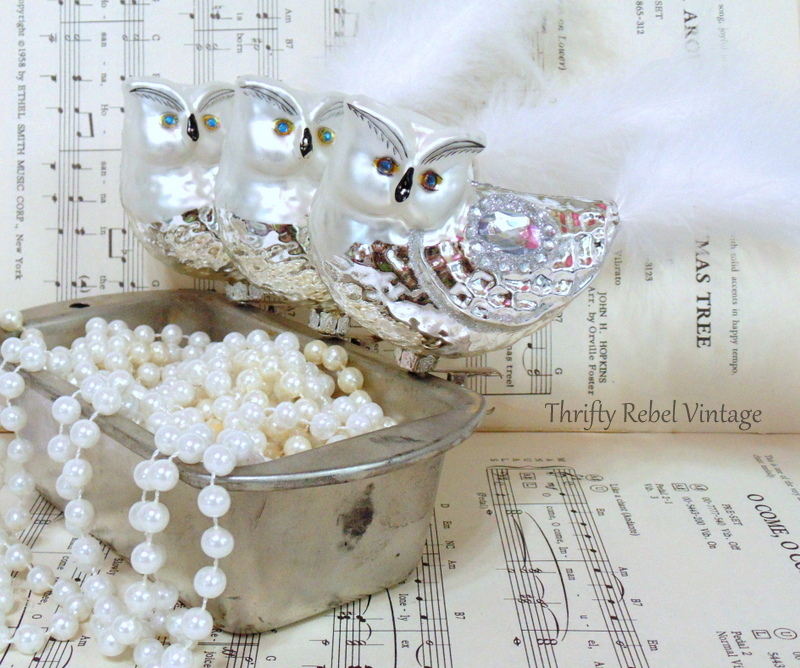 Your owls are beautiful, but not vintage. Vintage clip-on glass ornaments don’t have the ornament “caps” on the bottom. 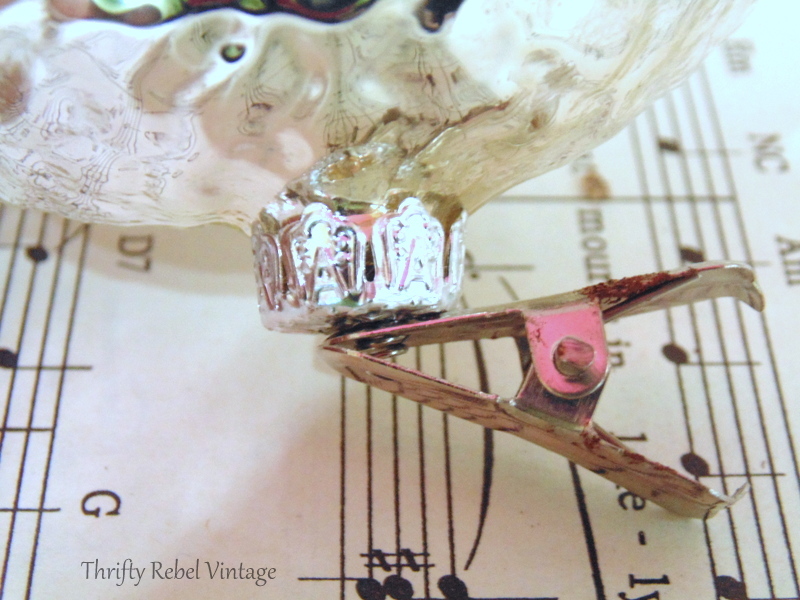 The clip is simply attached to a springy post that goes up into the body of the ornament. If you look at the ones on eBay that were mentioned by Olivia, you’ll see what I mean. Still a nice find and one I’m sure you’ll enjoy for many Christmases to come! WOW!! What a great find. I love them all. Hi Tula, that was an IKEAStart the car moment for sure. Can’t have two many owl ornaments. I add one or two to my collection every year and the best ones are the ones you find unexpectedly. Happy hunting (thrifting) I mean.